With the price of homes and real-estate these days, finishing your basement can give you the most inexpensive way to add additional living space to your home. This living space increases the current value of your home making it a sound investment. As the price of your home goes up the investment in your basement will also increase. At the same time it allows your family to enjoy a new living space for a variety of activities. The Better Basement Company is unique when it comes to basement finishing companies. We offer the traditional finished basements using different types of sheet rock and also install a proprietary soft wall panel system. Manufacturing is done right here in our home state of New Jersey and we have completed installations in over 12 states. Our reputation for unique and functional basement designs has brought us numerous accolades from customers and competitors. The proof…over half of our installations come from customer referrals. Our reputation is enhanced even more by the installation of unique wine cellars; home theaters and onsite custom-built bars from traditional American Saloon bars to live edge bar tops cut from 200 year old local trees. We combine quality workmanship, superior knowledge, and fair prices to make your needs and desires a beautiful reality. From design concept to finished living space in two to four weeks, The Better Basement Company prides itself on doing the job right. Do you use outside contractors? Some companies are only qualified to handle certain aspects of your basement remodel. 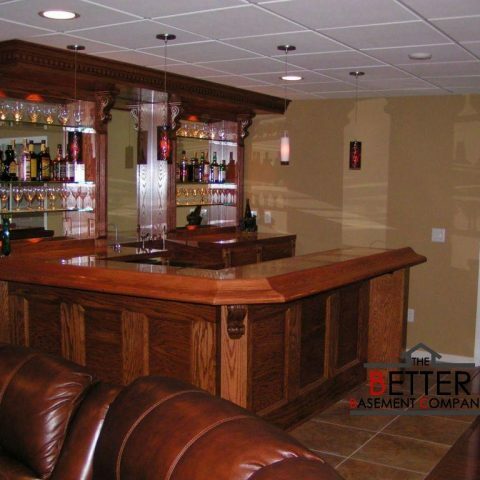 The Better Basement Company is all inclusive in it’s approach to your project. We deal with every single aspect of the job. This means that there is no finger pointing at a sub-contractor if a particular component of the remodel is delayed or incorrectly completed. With our total management of the job, you are free to make one phone call to have your questions answered and potential problems rectified. The Better Basement Company begins with your input. Our first visit to your home is a consultation, not a sales call. Our biggest job is to listen to you. Once we get a feel for how you want to use the space, we can help turn your ideas into a realistic floor plan that addresses all building codes and with an eye toward the aesthetics of the finished job.